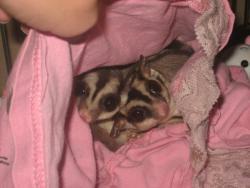 Story These are sugar gliders, Australian marsupials. They are nocturnal, and rare, but getting more popular. Mine are named Smudge and Pudge. They are just like any other animal, they will grow attached to you. Even though they have a sugar glider formula that is given to them, it is also recommended that they are given fruits and vegetables. Their favorite fruit is green grapes, and their favorite vegetable is green bell pepper. By CavalierSpaniel : Hi Pudge and Smudge! I voted for you. Please vote for me (by clicking on my owner's name to see the pets and then voting)! By Badger : so cute! !